The appeal of Obama to some Christians is his stance on war. He is not a pacifist… not considering his (ill-considered) threats to invade Pakistan and his plan to do a surge in Afghanistan. Yet, simply because he wants a complete, hurried pullout from Iraq, essentially regardless of consequences in Iraq, he seems to reap the “peacemaker award” from some Christians, just because they think he seems more reluctant to go to war… although how they square that with his plans for Pakistan is beyond me. Nevertheless, here are two statements about the Christian requirement to wage just war. The first is a straightforward “everyman” type of argument, that is quite clear, concise, and hard to deny. 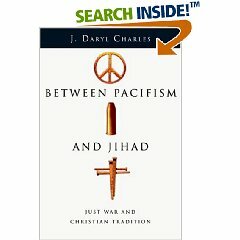 The second is a very thorough treatment of the entire topic of just war, pacifism and jihad. It is the product of very careful scholarship, with references aplenty for every assertion it makes about Christian tradition. At the Amazon link, there are a couple of reviews. Be warned that the single very negative review commits all the failures to engage with the central arguments of the book that it accuses the author of the book of committing. I can only encourage you to read the book for yourself, and come to your own conclusions about the scholarly rigor and theological care the author employs. The writer of the very negative review does not want you to read the book. One wonders what he is afraid you might learn. It is odd that the Left gives Obama “peacemaker” status because he chooses to fight different wars, to different degrees, than the Bush Administration. It is, I suppose, more evidence of Bush Derangement Syndrome.